Douglas Engelbart (’48 EE) invented the first point-and-click mouse in 1964, and numerous variations on the original design have surfaced since then. For their 21st-century senior project, electrical and computer engineering students Mushfiqur Sarker, Anton Bilbaeno, and Jason Muhlestein sought to make computer interaction even more intuitive by eliminating the need to be tethered to a mouse. 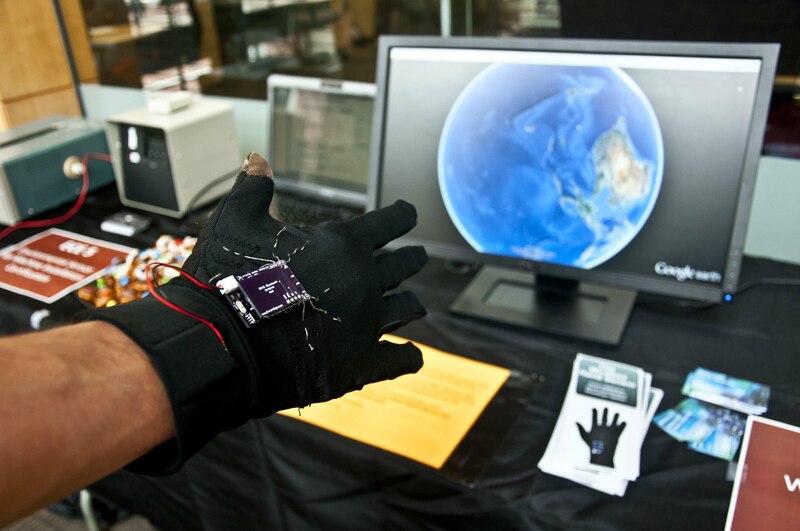 Their solution is a glove that allows users to wirelessly control their computers. The team built a system that senses hand rotation to control a computer mouse, similar to how an iPhone senses rotation. The invention shows promise for use not only by gamers, but people with arthritis or carpal tunnel syndrome, visual presenters, robotics controllers, and others. It is compatible with any Bluetooth-enabled Windows computer and features two sensors — an accelerometer and a gyroscope to map the rotation angles. Eight touch sensors on the glove fingers function when tapped with the gloved thumb. The touch sensors and glove sensitivity are fully customizable. The glove weighs eight ounces, and one size fits all. It features an easily replaceable battery with an average battery life of 10 hours. Among team challenges, said Bilbaeno, was piecing together the conductive fabric and thread from which the glove is primarily composed. His mother, a manager at Nike in Portland, assisted the team in designing the glove from scratch.